Official: More Progress Than Meets Eye In Libya NATO's chief of operations and intelligence says Moammar Gadhafi is now unable to effectively communicate with his forces in the field and is having problems resupplying his troops. But Maj. Gen. Mark Ramsay acknowledges that it's proving hard to destroy the weaponry being used to pound Misrata. 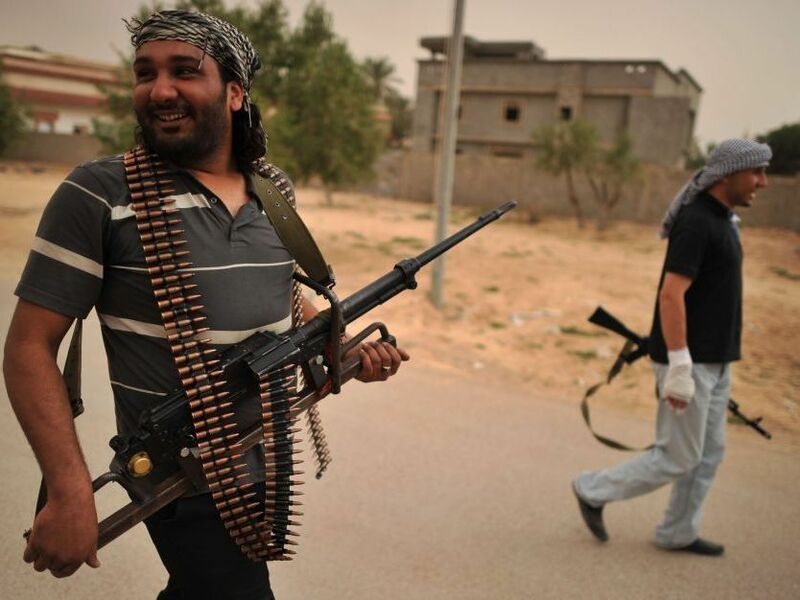 Libyan rebels patrol near the airport at al-Ghiran, close to the key port city of Misrata, on April 30. There's little sign of an end to the conflict in Libya, nearly two months after Western fighter jets began bombing leader Moammar Gadhafi's forces. The disorganized anti-Gadhafi rebels have been unable to break out of their stronghold of Benghazi in eastern Libya despite the air support. With signs of a military deadlock, some in the West are calling for a renewed focus on isolating the Libyan dictator financially and politically. But NATO commanders leading the war effort caution patience and insist there has been more progress than meets the eye. Everything points to a prolonged stalemate in Libya. In the east, the front is static: Gadhafi's forces are dug in near the important oil ports of Brega and Ras Lanuf. In the west, the dictator's forces are shelling the town of Zintan and are in firm control of Tripoli, the capital. In Misrata, the rebel's main western enclave, Gadhafi's forces still control the airport and all access to the city except the port, which Gadhafi has tried to mine and which he sporadically shells with heavy artillery. But to U.S. Air Force Maj. Gen. Mark Ramsay, the glass is half-full. NATO's chief of operations and intelligence says Gadhafi now is unable to effectively command his forces in the field. Take communications: Gadhafi, he says, now has to use unsecured phones and couriers. "He has to resort to all sorts of measures that no military professional wants to resort to," Ramsay says. "I wouldn't say he's in the 1860 cavalry mode, but it's getting pretty close to that." In addition, Ramsay says Gadhafi is having huge problems resupplying his troops with the basics — bullets, food, spare parts — things essential to sustaining any military campaign. "Every day he wakes up, he has less fuel, he has less ammunition and he has less ability to control the forces he's got," Ramsay says. "And we're seeing that play out on the ground very vividly in that it's pretty obvious the balance is tipping not in his favor." Yet the Libyan military has proved an adaptive, crafty enemy for NATO. After NATO destroyed or damaged some 260 of his tanks and armored personnel carriers, Gadhafi changed tactics. He effectively deployed mobile mortar and rocket teams in modified pickup trucks and other vehicles that more easily blend in with the civilian population. It worked against rebels in the east and civilians who'd risen up against the regime in Misrata. 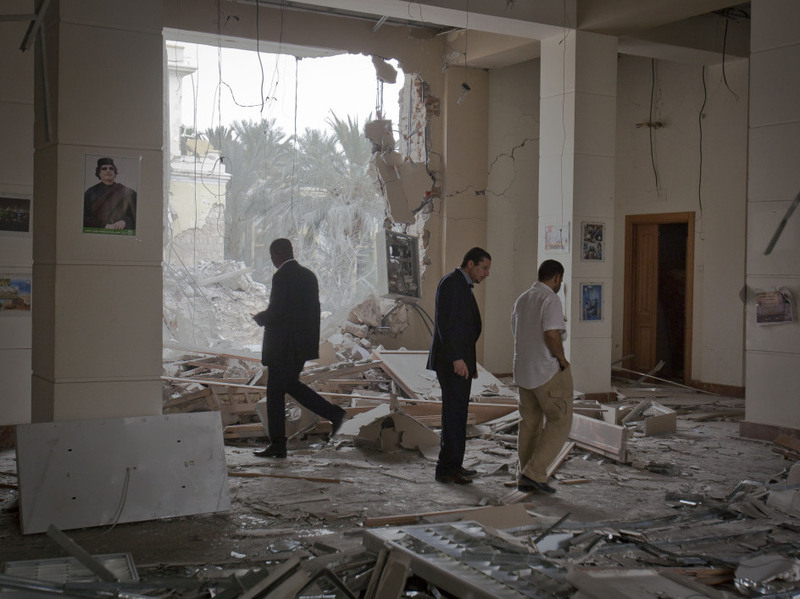 In this photo taken on a government-organized tour, officials inspect damage at the scene of an airstrike in Tripoli, Libya, on April 30. "We have absolutely irrefutable evidence that he used likely mortar fire to drop cluster munitions on his own people for the express purpose of killing and injuring them," Ramsay says. "Had NATO not stepped in, the situation would have been much more grave. And, in fact, the regime probably would have overrun the opposition and threatened many more civilians in the city of Misrata and other major cities in Libya." But Gadhafi's forces continue to change tactics and escalate attacks against Misrata, including repeated efforts to mine the port, the city's lifeline. On Saturday, his troops pounded the city's fuel terminal with Grad rockets, igniting a massive fire that threatened to destroy Misrata's already limited fuel supply. Ramsay says Gadhafi still has a few 155 mm self-propelled howitzers and rocket launchers deployed on the edge of Misrata that he's using to attack key infrastructure. The shelling has made it much harder to deliver vital aid and evacuate wounded civilians and stranded migrant workers. The mobile artillery, Ramsay says, is well hidden and proving hard to destroy. "They literally pop out, fire, and go back under cover," he says. "Either completely out of cover or they are parked next to a civilian house or other facilities where the possibility of collateral damage or death to innocent civilians is just too great for us to strike them." To many observers, it appears NATO is directly targeting Gadhafi for assassination — something that is not part of the U.N. resolution. The dictator has had at least two close calls when NATO bombed sites where he was working. Many wonder if NATO defines a command-and-control site as anywhere Gadhafi might be napping or talking on a phone. But Ramsay insists that's not the case. "We are not targeting anybody's homes," he says. "The facilities that we have targeted are absolutely, clearly his regime's command and control facilities to control his fielded military forces." The White House likes to say the U.S. is largely in a supporting role in Libya. But in addition to supplying some three-fourths of the aerial refueling, American NATO officials say U.S. fighter jets have been used recently to bomb radar sites when Gadhafi has tried to reconstitute his air-defense system. The U.S. also has two Predator drones armed with Hellfire missiles in the air over Libya around the clock, providing surveillance and, when needed, attacking.